“Big Data” and “Analytics” are widely considered to be the next frontier for innovation and competition across business, government and education. Of course, this this is a big opportunity for HR. Organizations collect more HR and business data than ever, but they still aren’t using that data effectively to identify key drivers of true business outcomes—and create effective talent strategies. In this two-book series, Scott Mondore and Shane Douthitt provide practical guides to demonstrate how to use the Business Partner Roadmap to connect HR data with business outcomes. 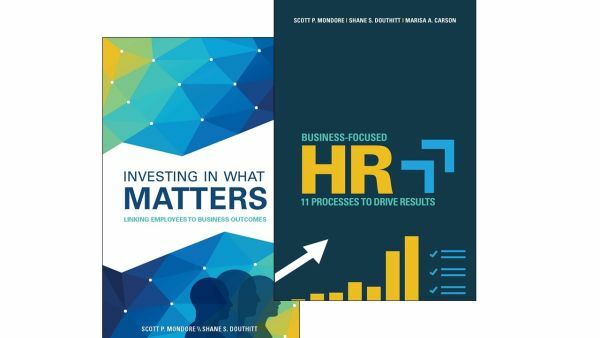 Through case studies that apply their analytic approach, these books show you how to create an HR strategy that impacts business outcomes, maximize the business impact of HR initiatives (e.g. surveys, 360s), identify key HR metrics, and calculate an expected or actual ROI. By providing this framework and roadmap, HR professionals will be able to use HR Analytics to identify key people drivers of business outcomes. The stakes remain the same for organizations and HR leaders, whether we are in a booming or lagging economy—HR professionals must show the value of what they do and build a compelling business case to get other, potentially skeptical, leaders to buy in. Business-Focused HR will provide the tools for HR leaders and people managers across the organization to become more business-focused with the processes that they execute. Senior HR leaders can make the business case to top management, while front-line practitioners can demonstrate the value of what they do to managers on the "shop-room floor." Having a practical resource that takes HR leaders step-by-step through what the latest research tells us, from best practices in execution to linking the process directly to business outcomes, is the goal of this book. Ultimately, the aim is for Business-Focused HR to become the guidebook for all HR leaders to enable them to become strategic business partners at all levels and across all functions in their organizations. Watch Scott Mondore's on-demand webcast and learn how to connect HR data and business metrics that matter most to executives. Providing a structured approach for HR professionals, this case study rich book instructs managers and business leaders how to use analytics to connect employee data to business outcomes. Practical and informative, Investing in What Matters emphasizes the direct impact of employees on business outcomes. A flexible approach that can be tailored to any organization guides HR personnel through the process of gaining senior leadership buy-in, identifying opportunities in the workforce, building data-driven solutions and calculating return-on-investment. From driving sales to decreasing turnover, this process transforms the workforce into a business' biggest asset. Dr. Scott P. Mondore is a Managing Partner of Strategic Management Decisions and has significant experience in the areas of corporate strategy, talent management, measurement, customer experience, and organizational development. He has worked for years in internal management and consulting positions across a variety of industries, including transportation, health care, manufacturing, utilities, and hospitality. Dr. Shane S. Douthitt is a Managing Partner of Strategic Management Decisions and has over 15 years of experience in the areas of measurement, talent management, executive assessment and coaching, and organizational development. He has practical experience across a variety of industries, including banking, manufacturing, utilities, pharmaceuticals, and information technology.